This is one of those dishes I prepare at home that my husband and son like. 1. Marinate pork for about an hour. 2. Drain pork and reserve marinade. 3. 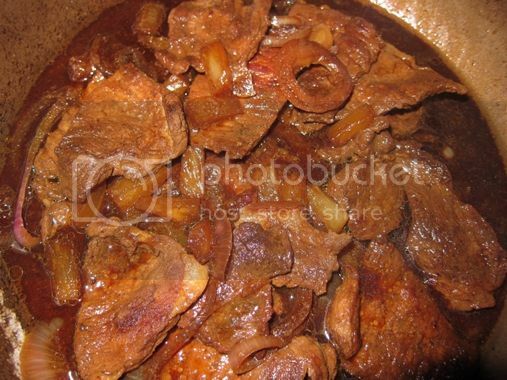 Fry pork in cooking oil until light brown. 4. Remove excess oil from pan. 6. Add pork and pineapple tidbits. 7. Pour in marinade and water. 8. Add pepper to taste. 9. Simmer for a few minutes. Looks good! I should admit that I’ve never heard of this dish before. I will soon try this at home!